Cessna 205 VH-KMF at Essendon on 26th December 1974. 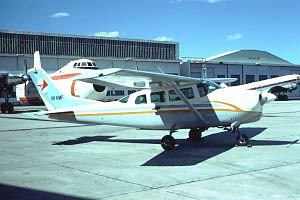 Although officially a Cessna 210-5A, the aircraft was in reality a Cessna 205. The 210-5 was a development of the 210C but had a fixed tri-cycle undercarriage, a 3300lbs TOGW, a stretched fuselage incorporating an extra port side door, two main doors and six seats. It was powered by a 260hp Continental and it, in turn, was developed into the Cessna 206 whilst the 210 line continued on to the 210D etc. Development history by Tony Arbon.